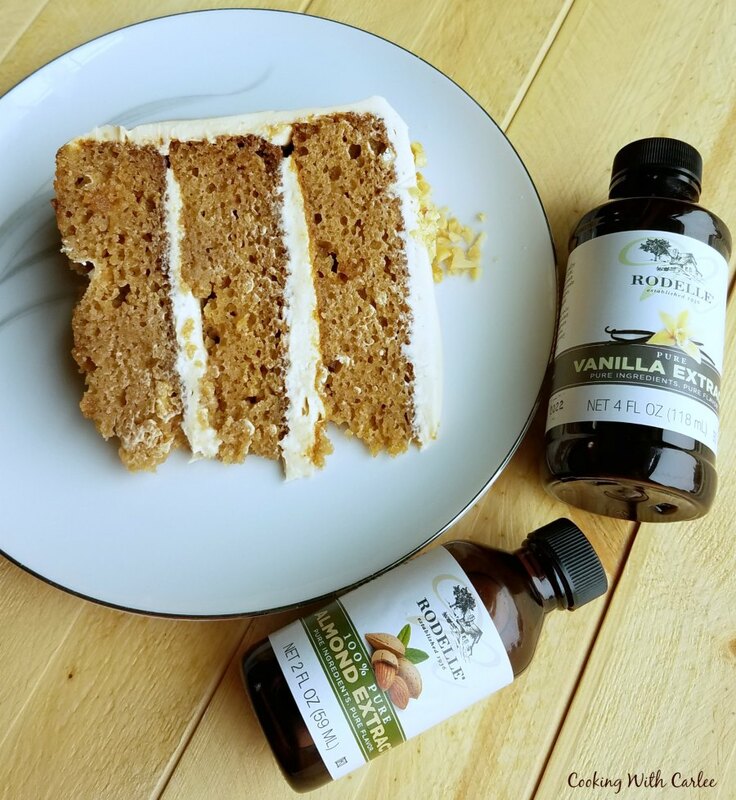 Rodelle Vanilla provided me with extracts for recipe development and a great prize package for our readers as part of #AppleWeek. All opinions are my own. 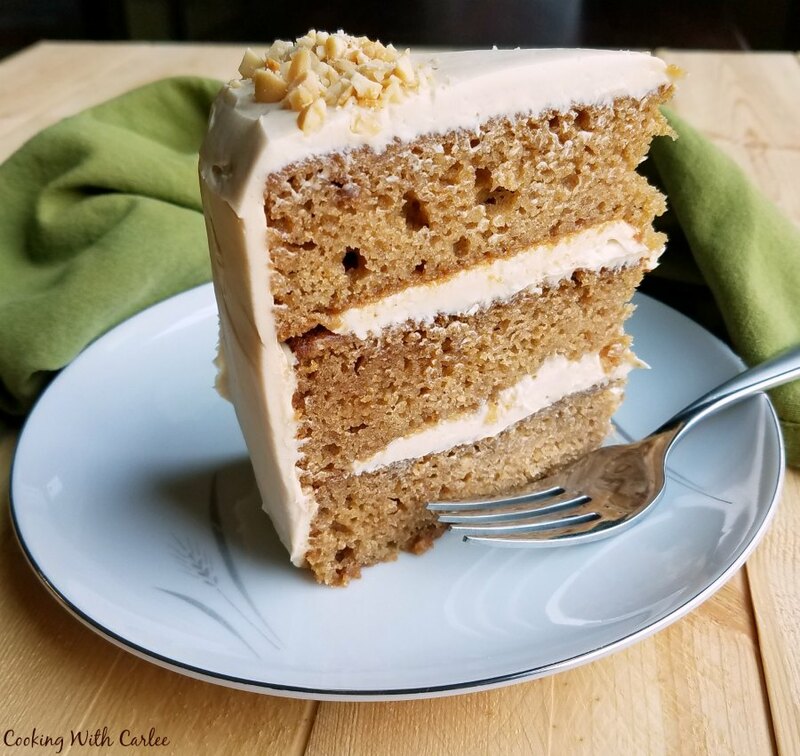 Slightly spiced and super moist applesauce cake goes perfectly with a soft and luscious cream cheese and caramel frosting. This is the stuff fall dreams are made of! I have something to tell you. Cake and I have been in a serious relationship for a little while now. We've been trying to keep it quiet, but have decided to go ahead and make it public. I suppose my love for all things cake and frosting is pretty well documented at this point. 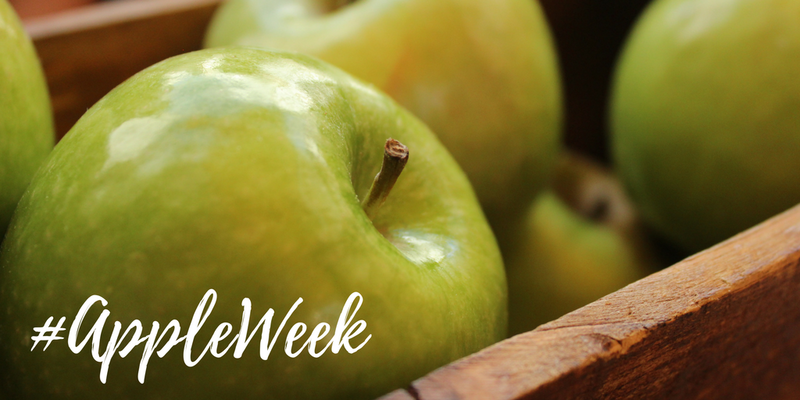 So when Rodelle Vanilla signed on as an #appleweek sponsor, my brain immediately started thinking cake! A nice moist applesauce cake would do the trick nicely. I wanted it to have just a hint of cinnamon, but not too much. I wanted the apple, vanilla and almond flavors to really mingle and star in this show. Oh gracious, they were definitely a match made in... well, heaven! It didn't take much thought at all to know the frosting should have caramel tones in it. While I absolutely love the creamy caramel sweetened condensed milk frosting, I had something a little softer in mind. I thought about starting from scratch, but why reinvent the wheel? So I tinkered with what I already knew was amazing to make it more what I had in mind. It turns out all it needed was more cream cheese! This is one of those frostings you could eat with a spoon. Or maybe you should eat it with sliced apples! First of all it is not tooth achingly sweet. It is creamy, soft, luscious and a perfect balance of caramel and cream cheese flavors. As you can imagine, it was the perfect foil for the apple cake. This time I decided to get super fancy and chop a few peanuts to sprinkle on top. That way it was just like a caramel apple! Luckily this cake tastes so good you don't need a bunch of intricate decoration. As soon as the first person takes a bite and shuts their eyes as they let out a "mmmmmm," everyone will be sold! I actually made this cake for our annual shrimp boil this year. I knew I would be busy the day of the party, so I made it a few days ahead. I just let them cool for a while on the wire racks and then wrapped them in plastic wrap and froze them until the day of the party. Then all I had to do was whip up some frosting and spread it on. In fact that is my favorite way to do cakes. It spreads out the work and I think helps the cake be extra moist and delicious! Preheat oven to 350 F and prepared 3 9" cake pans. In a bowl, whisk together flour, baking powder, baking soda, salt and cinnamon until well mixed and no clumps are present. In your mixer, cream the vanilla, almond extract, butter, brown sugar and sugar until light and fluffy. Add the eggs, one at a time, beating until mixed. Mix in the applesauce. It is ok if it looks a little curdled at this stage. Stir in the dry ingredients until just mixed and then divide batter among the prepared pans. Bake for 30-35 minutes or until the cakes test done. Cool for 10 minutes in the pan and then tip onto wire racks to cool completely. You can make your cakes ahead of time. Just wrap them in plastic wrap and freeze until you are ready to decorate. Cool caramel mixture to room temperature. This may take a while, but you can put it in the refrigerator to speed the process if you want to. When cooled, it should be thick enough to almost hold it's shape. Apple Cake LOVE! This looks incredible and is such a beautiful cake for Fall! Adore a good vanilla, it makes all the difference in baking! Good vanilla really does make a big difference, doesn't it? And thank you so much! This was definitely a popular treat. Luckily I did have some folks over to help eat it or I would have been in big trouble if I were left alone with it! That sounds yummy! We just made some apple spice cupcakes with caramel buttercream frosting last week; great minds think alike I guess! Hi Carlee, this really isn't helping! I've started craving a nice slice of homemade cake, but have not had the time to make one. When I find the time my first choice was chocolate, but now I'm not so sure, this cake looks and sounds the business! I made a (bonus) applesauce cake this week to highlight the Pyrex dish. I'm definitely NOT showing yours to my boys since ours was totally plain. No frosting. They would like yours better I'm sure. I saw yours and it looked delicious. I am a frosting girl though, so any chance I get to pile it high is taken advantage of! What a gorgeous cake Carlee. You always make the most flavor and pretty looking cakes! I like the size of that slice 😀. Might be just enough for me, lol. You had me at caramel cream cheese frosting. Yummy! Hehe! Well if you are going to go for it, you might as well do it up right! I have to admit I reeeeeeally like the frosting on this one. Not too sweet and both the caramel and cream cheese flavors really came through. This one is definitely going to become a fall tradition! I love that frosting recipe! And of course the cake is simply beautiful - simple and elegant. Thank you so much, Lauren! The frosting and the cake really are perfect for each other! You had me at cream cheese frosting! My hubby loves apple stuff and I know he would drool over this. Thanks for linking up with Tasty Tuesday @ The Blended Blog! This is perfect for the two of you then! Thanks so much for stopping by! 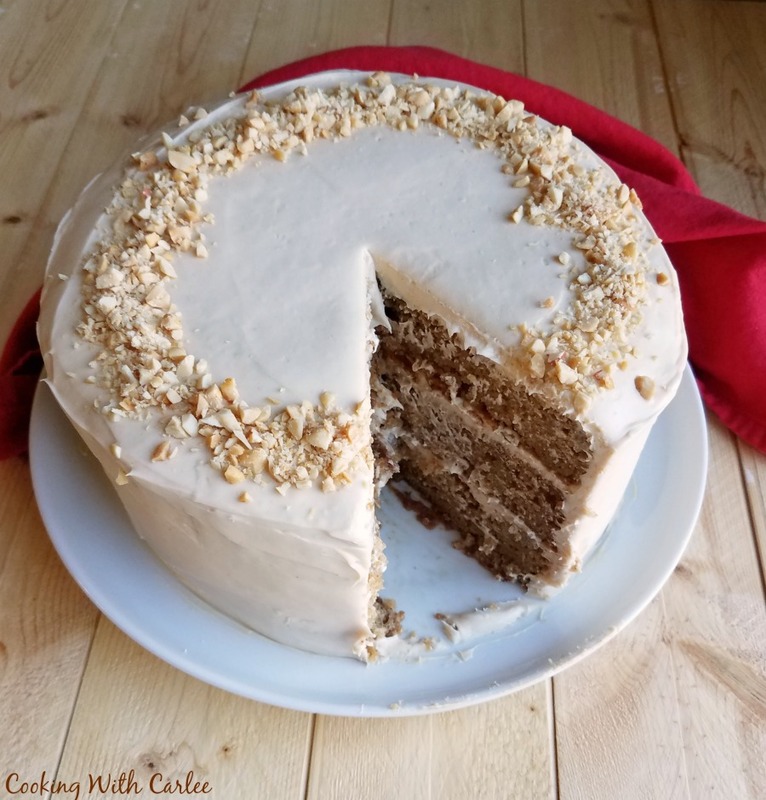 I love the way you decorated this cake and the flavor combo sounds amazing! Oh, forgot to add that apple pie and apple cobbler are two of my favorite recipes. Pretty soon I will add this cake to the list! Those are two of my favorites as well!! I'm excited to try this! I've never made an applesauce cake before! You totally have to then! It is perfect for fall! This looks like a perfect cake for the fall weather coming soon, I hope! Hope you are having a good week and thanks so much for sharing with us at Full Plate Thursday! 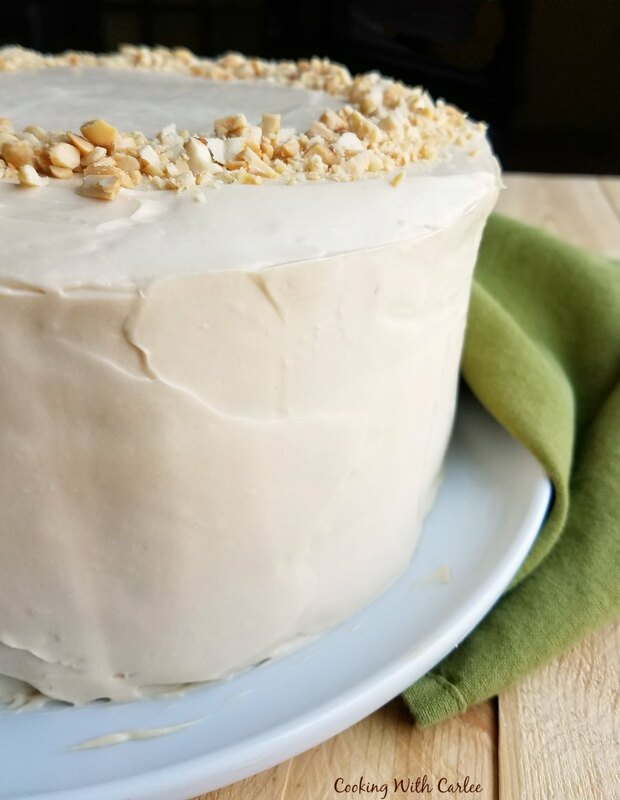 It is definitely a perfect fall cake! Thank you! My husband loves applesauce so one would think this cake could be his new favorite. I can't wait to make it.